With my return to university, I have rediscovered the many ways students can get discounts on Textbooks, University FEE-HELP & HECS-HELP course fees, Magazine subscriptions, Public Transport, Travel in Australia and Overseas, Computer software and hardware and more. If you’re a member of a student union you may also be eligible for discounts on food purchased from campus cafeterias, cheaper tickets to student parties and discounts at retail outlets, cheaper grocery shopping, accommodation, leisure Activities etc if you show them your student union card. Deferring a debt of $2960 using a FEE-HELP loan, waiting until after Census date roughly 4th week of semester for the debt to be recorded by the ATO and making a payment of 2690.91 before the end of the financial year when it would get indexed to CPI (inc. 9.09% discount saving you $269.09). The next biggest saving Students can make is on public transport fares (buses, trains, ferries, light rail etc). In NSW If you’re studying full time and are an Australian citizen or resident you may be entitled to a concession on these forms of transport. Go to your Student Info and Admin Centre to apply if you do not have the travel symbol on your student card. I’m sure similar rules apply in other Australian States and Territories. Whether you’re doing an IT degree or not, these days no student can do without a computer and associated software. Your first queries should be made to your university/TAFE IT Support department. It’s quite likely that they have special deals eg: 5% off with large computer companies like Microsoft, Dell and Lenovo (new name for IBM computers) so that you can buy at corporate prices and save money. Educationsoftware.com.au exists to deliver Australian students, academic staff and education institutions the best prices, fast delivery and easy ordering on the most popular education software titles. Individual computer stores like the reputable Techbuy (sydney) offer student discounts on some of their basic PC’s and other accessories so it’s worth asking if you can get a student discount of the retail price. 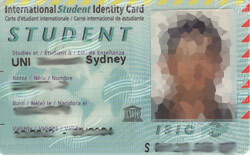 The International Student Identity Card (ISIC) is the only internationally accepted student ID card. Since its launch in 1968, the ISIC has helped over 40 million students to get the most out of their travel experience. With access to a global network of affordable and specialised student services, the ISIC is your passport to more than 32,000 discounts and benefits in 106 countries worldwide. I got one when I travelled in Europe in 2003 and it saved me $100’s of dollars on transport, entry fees to museums like the Louvre museum in Paris, food, airline flights, accomodation and much more. The cost for an ISIC card was a mere $AUS18 as at August 2006. YHA is affiliated with Hostelling International, the brand name of more than 90 Youth Hostel Associations in over 80 countries, operating 4,000+ hostels. No other hostel operator can match us for sheer quality or variety of accommodation! Unlike bland motels, impersonal hotels or dodgy backpackers, HI Youth Hostels are fun, lively meeting places, full of like-minded people. HI is a non-profit membership organisation, with a proud history and a relevant philosophy. Most cinemas offer their cheapest tickets on a particular day of the week eg: Tuesday, plus on other days you are able to get a student discount. 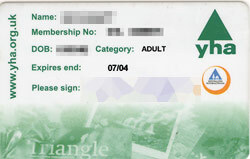 Similarly tickets for theatre shows, music tours and sporting events often have discount Student priced tickets. Students on low incomes may be eligible for a Health Care Card (HCC) through Centrelink. You do not have to be on a Centrelink benefit to be eligible for a HCC. To be eligible your income as a single person should be no more that $336 gross per week, or $2,688 over eight weeks. Cardholders are entitled to Commonwealth health concessions such as low cost medicines. Other concessions may be available to card holders who are on Centrelink benefits, e.g. Concessions from State and Local Government authorities such as reductions in property and water rates, energy bills, reductions on motor vehicle registration, a wide range of other health, household, educational and recreational concessions. You should always check with Centrelink (http://www.centrelink.gov.au) for up to date and complete details. I would also recommend getting your international student ID. You don’t have to get it from STA travel, but they will help you through the process. I loved this card when I had it. It really helped me get some great deals when I back-packed (more like duffle-bagged) Europe. I would recommend it to anyone in college or uni. Some very decent information here that can be invaluable to all students. I will offer two cents and this is from a UK perspective so not sure if it will help too much but it could be applicable. For textbooks we have a few UK based companies that allow textbook rental at a very cheap price and therefore saves you money as you don’t have to purchase the textbook, maybe there are some USA based companies that do this too. Secondly – Networking – this is essential at University I have found, the more people i meet the more people i know that operate in different areas that could possible help me out such as having discount in the shops they work in, etc. Network, network, network!! Good suggestions for college students. College students need all the discounts they can get! The international student identity card seems particularly useful, as a lot of college student choose to study abroad at some point during their college career. Wow I had no idea that an ISIC card even existed until now, thanks, I’m going to have to pick one up and start traveling.